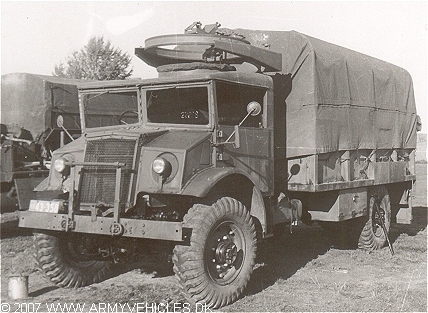 Danish Army Specific: The Chevrolet 8443 was presumably delivered as a part of the Canadian aid program (MDAP) between 1951 - 1955. Historical: More than 200.000 of this type of truck (3 ton, 4 x 4) was build in Canada during WW II by Chevrolet and Ford, similar in design but differing in details as engine, drive line and axles. Standard CMP 158 inch wheelbase chassis. Length: 4.62 m (244 inches). Width: 2.38 m (90 inches). Height: 2.87 m (120 inches). Weight: 5.900 kg (16.000 lb.). Engine: Own 6-cylinder, 3.548 cm3 (216 cubic inches) displacement, liquid cooled, carburetor. Brakes: Hydraulic with vacuum servo assistance. Fuel capacity: 114 liter (25 gallons).